Several different deciduous hosts including: Oak (Quercus), Maple (Acer), Poplars (Populus), Birch (Betula), Ash (Fraxinus), Elm (Ulmus), others. 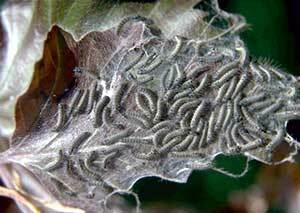 Although being similar to the eastern tent caterpillar in the larval stage, they do not make a noticeable web. 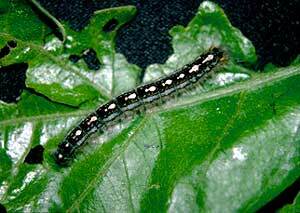 These larvae tend to climb higher in the host trees and are more dispersed throughout the host. 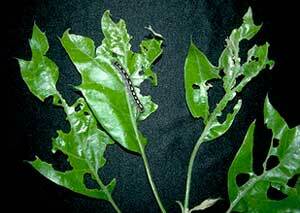 They are a defoliator and in high population numbers can cause serious defoliation to the host plant. Usually, however, their numbers are moderate to low and most of their feeding injury goes unnoticed. The larvae can sometimes be seen clustered in a large group on the trunk of the host. The forest tent caterpillar over-winters as an egg in a shiny, black eggmass that is very similar in appearance to that of the eastern tent caterpillar. Where the eastern tent caterpillar's egg mass is somewhat tapered at both ends, that of the forest tent caterpillar is square on the ends. Eggs hatch near the time of budbreak on the host plant and young larvae can create much damage to the newly expanding foliage. Afterwards, they will continue to feed on the fully expanded foliage. Pupation begins in mid to late spring in Massachusetts and adult moths appear soon thereafter. There is only one generation per year. Insecticidal soaps can be used on young larvae but proper coverage may be difficult on larger trees. Bacillus thuringiensis (B.t.) is effective on the younger larvae as well. This species does not produce a noticeable silken web that can be removed as with other species, such as the fall webworm and eastern tent caterpillar. Many chemical insecticides are also labeled for this pest. 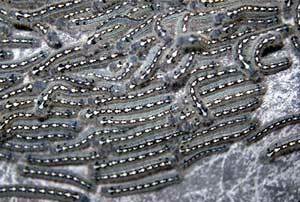 Eggs hatch around 192 growing degree days and the larvae actively feed for 5-6 weeks.